The mission will provide engineers with data about systems critical to crew safety, such as heat shield performance, separation events, avionics and software performance, attitude control and guidance, parachute deployment and recovery operations. 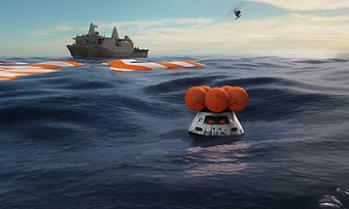 The results will fed into Orion’s Critical Design Review (CDR) scheduled for next year. Key processing and schedule milestones have been completed of late, including the all important paperwork. Well known throughout the era of the Space Shuttle Program (SSP), the Flight Readiness Review (FRR) is a key pre-flight review. 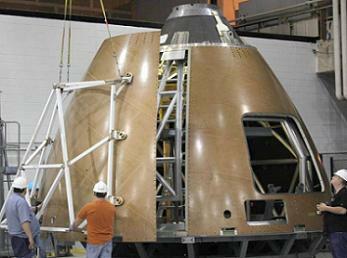 EFT-1 Orion’s review was conducted earlier this month at the Johnson Space Center (JSC) in Houston. Given EFT-1 is a test flight, the review was tagged as a (T)FRR. “After hearing endorsements from the various sub-systems, the FTRR Board recommended to proceed with preparations for a December launch,” noted L2’s EFT-1 Status Updates. A s was sometimes the case with Shuttle, FRRs can be passed with “actions” to be dealt with ahead of launch. Per the L2 notes, the EFT-1 review has three actions to work, set to be reviewed and signed off at a subsequent Delta FRR. Notably, the TFRR is not the same level as a Shuttle FRR. Lockheed Martin will still conduct its own FRR, while ULA will have a LRR that will be more aligned to the level of a shuttle FRR. The FTRR was held by the NASA Flight Test Management Office (FTMO), the NASA office responsible for support to this mission. This review was used to verifying readiness of the NASA support to this mission: the MCC, the recovery force and TDRSS/comm support. The spacecraft and launch vehicle readiness will be determined at the other two reviews. Both ULA and LM will each have a Presidents Review, which are the major reviews. At the Kennedy Space Center (KSC), EFT-1 Orion is now fully assembled and ready to make the trip to shake hands the Delta IV-Heavy that will loft her into space. The spacecraft will remain inside NASA’s Launch Abort System (LAS) Facility at KSC until a rollout to the awaiting Delta IV-H at SLC-37. This rollout will take place on November 10, ahead of which the Delta IV-H will enjoy a Wet Dress Rehearsal (WDR) on November 5, per L2 information. 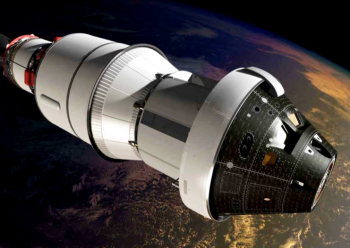 “An empty shell of a spacecraft arrived to Kennedy Space Center two years ago, and now we have a fully assembled Orion standing 72 feet tall,” noted Michael Hawes Lockheed Martin Orion program manager. Lockheed Martin – the prime contractor for Orion – noted the final assembly stages of the spacecraft included installing Orion’s Ogive panels, which protect the crew module from harsh acoustic and vibration environments during launch and ascent. Engineers also installed fasteners to secure the panels in place and covered them with a thermal protection coating. Orion was then lifted by crane, rotated into the proper orientation for mating with the Delta IV Heavy launch vehicle, and placed onto the transport pallet. The rollout is more complicated that simply trucking her across to the Cape pad. The vehicle has to avoid corrosion and contamination threats ahead of the eventual mating atop of the Delta IV-H.
As such, engineers performed a fairing purge test, which verifies how much dry gas needs to be pumped into the space between the Ogive panels and the spacecraft. The dry gas ensures that when Orion is transported, she will not accumulate moisture that could contaminate the spacecraft. The mating operations at SLC-37 will involve the spacecraft being raised 170 feet up into the air and and mated to the rocket. Engineers will then check out the integrated stack by powering up the interfaces between the two vehicles. A Launch Readiness Review (LRR) will then take place, at which point the launch date will be officially set. The current plan for December 4 results in a T-0 of 07:04 Eastern, the opening of a window that lasts until 09:44 Eastern. (Images: Via L2, Lockheed Martin and NASA).